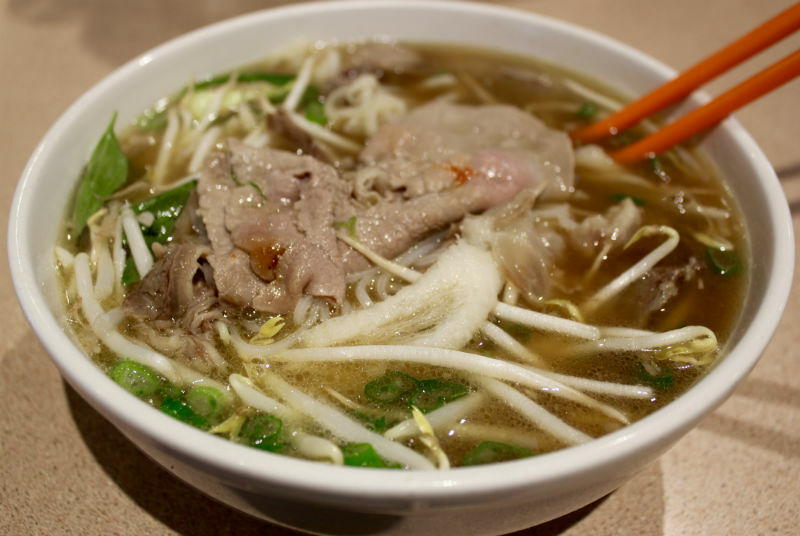 Restaurants usually offer multiple dish options, but at a small Vietnamese restaurant in City Heights, pho is the sole meal. Located on El Cajon Boulevard, Pho Hoa has been serving hungry customers for more than 30 years. The restaurant is open every day from 7 a.m. to 8 p.m. Sunday through Friday, and 7 a.m. to 9 p.m. on Saturdays. As Pho Hoa exclusively serves pho, it’s guaranteed fresh every visit. The menu offers a full page of mouth-watering options in small, medium and large sizes. Some of the restaurant’s specials are offered in extra-large for extra-hungry customers, but those don’t feature as many types of meat. One option from the extensive menu is the Tái, Chín, Gau, Gân, Sách ($7.94), which features rare steak, well-done brisket and flank, tendon and tripe served with noodles in a steaming hot broth. The simpler options are around $6 and contain Vietnamese meatballs or only one type of meat, while the more extensive options contain five types of meat and are priced at $8.50 or higher. One of the great things about Pho Hoa is that the cooks don’t skimp on any of the ingredients, especially the meat. Similar to most pho places, Pho Hoa offers sriracha, hoisin or fish sauce, Thai basil, bean sprouts, limes and jalapenos. As a general hint, try the pho without the additions first. As another tip, don’t add too much sriracha or fish sauce — a little goes a long way with this dish. The establishment offers a variety of beers for those customers of legal drinking age, as well as an assortment of tea or soft drinks. Pho Hoa is surprisingly large on the inside and features wall-to-wall tables, perfect for large groups of friends after school or work. However, do not decide on dinner at Pho Hoa if you’re looking for ambience. The inside feels like a cafeteria and only features indoor seating. Fortunately, the food makes up for it. Pho Hoa also takes to-go orders, allowing customers to enjoy the food in the comfort of their own homes.